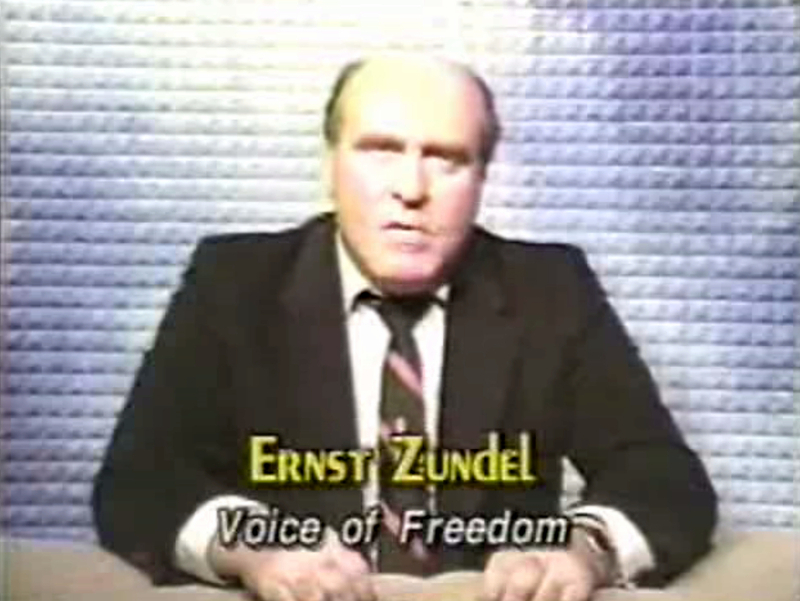 German neo-Nazi and Holocaust denier Ernst Zündel launching his “Voice of Freedom” programme: “We hope to be politically incorrect, uncorrect. […] We want to bring you the rebels”. 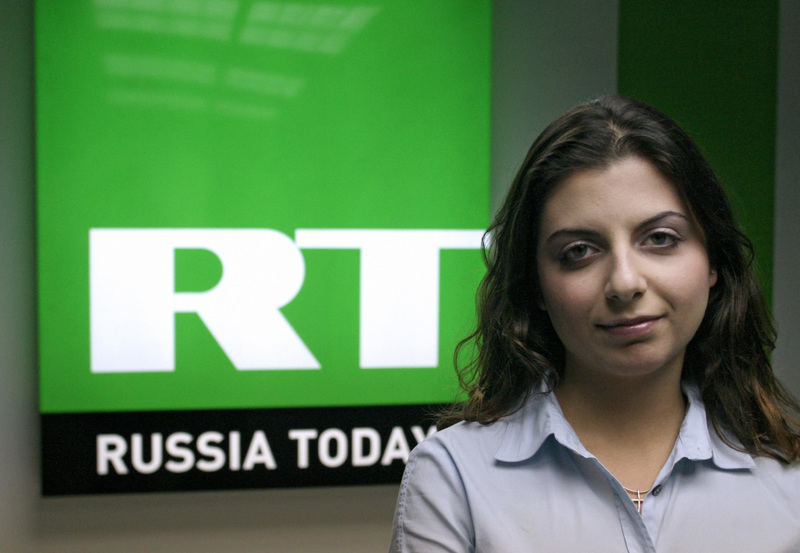 Margarita Simonyan, Editor-in-Chief of Russia Today (later, RT). 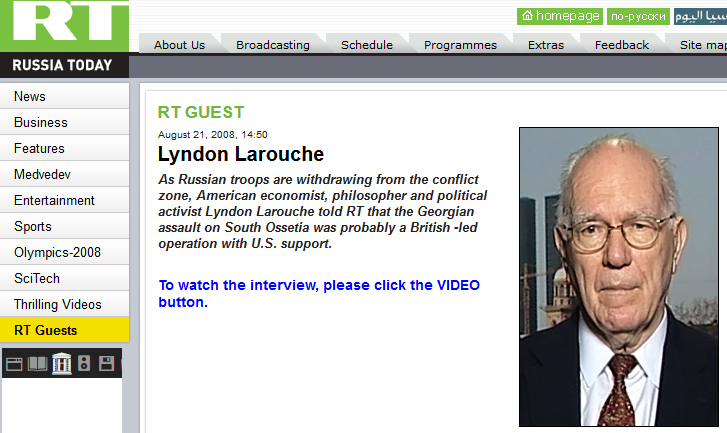 American far-right activist Lyndon LaRouche, a special guest on Russia Today on the 21st of August 2008. 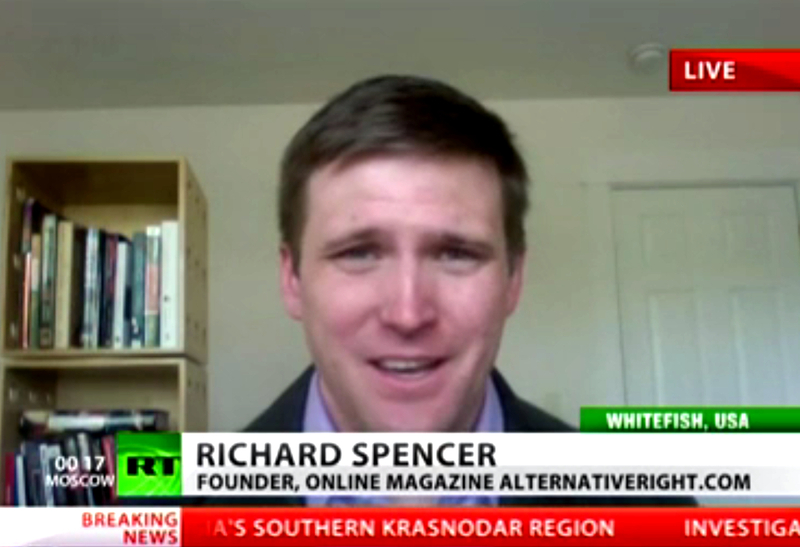 American neo-Nazi Richard Spencer as an “expert” on Libya on RT, 9 July 2012. 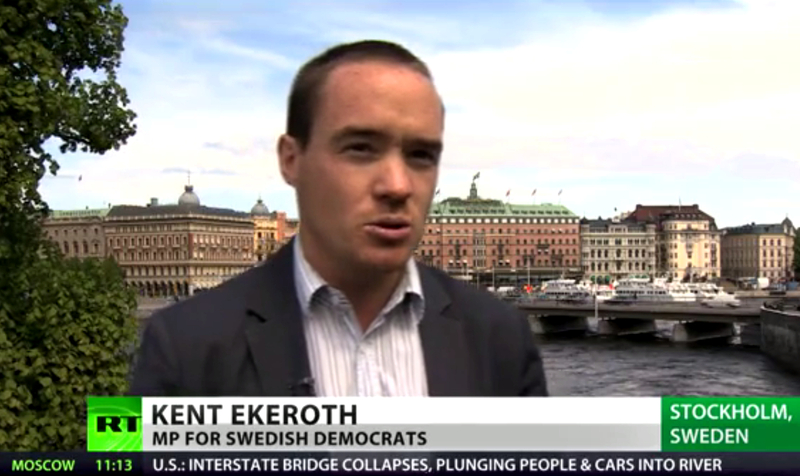 Kent Ekeroth, MP of the far-right Sweden Democrats, as a commentator for RT on its report on integration in Sweden, 23 May 2013. 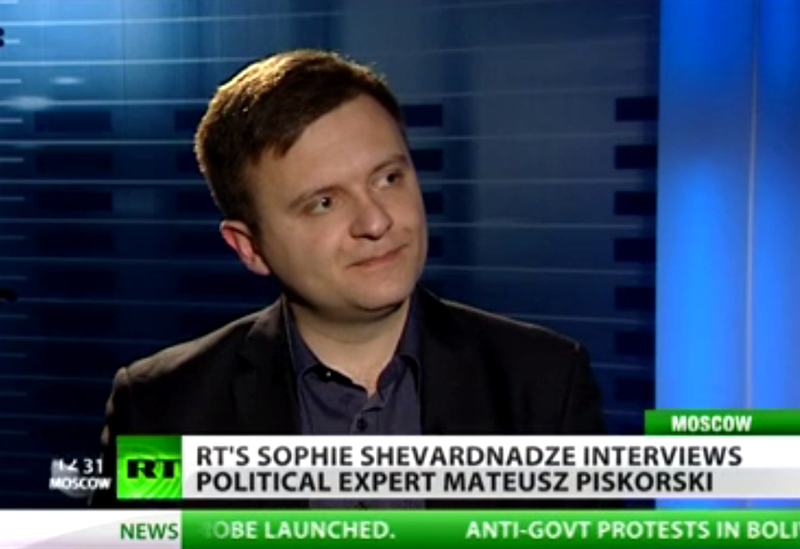 Polish far-right activist Mateusz Piskorski was a frequent commentator for RT. The Russian state-controlled First Channel communicates commentary on the Ukrainian revolution (2013-2014) by Marine Le Pen, the leader of the far-right National Front, 14 December 2013. The future founders of the ProRussia.TV (left to right) Gilles Arnaud, Guillaume Tastet, Igor Belokone (translator) and Joseph-Marie Joly at the summit “Global Media: Challenges of the Twenty First Century” organised by ITAR-TASS and held in Moscow on 5-7 July 2012. 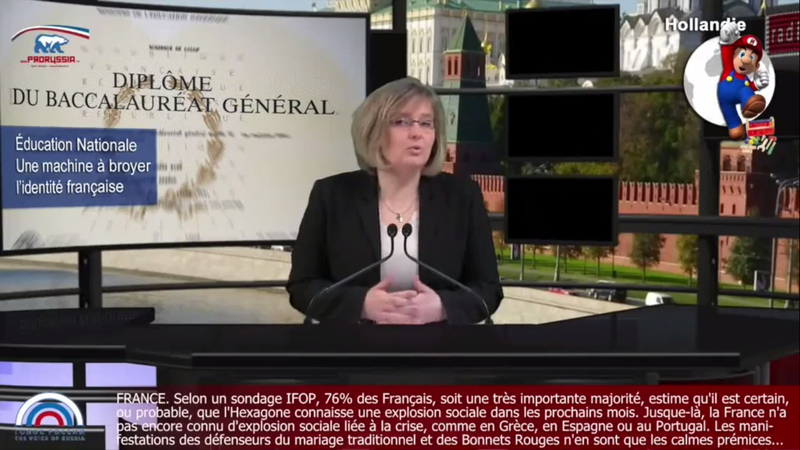 Sylvie Collet, a member of the far-right Party of France, as an anchor of the programme “Weekly Journal” produced by ProRussia.TV for the French edition of the Voice of Russia, 9 December 2013. 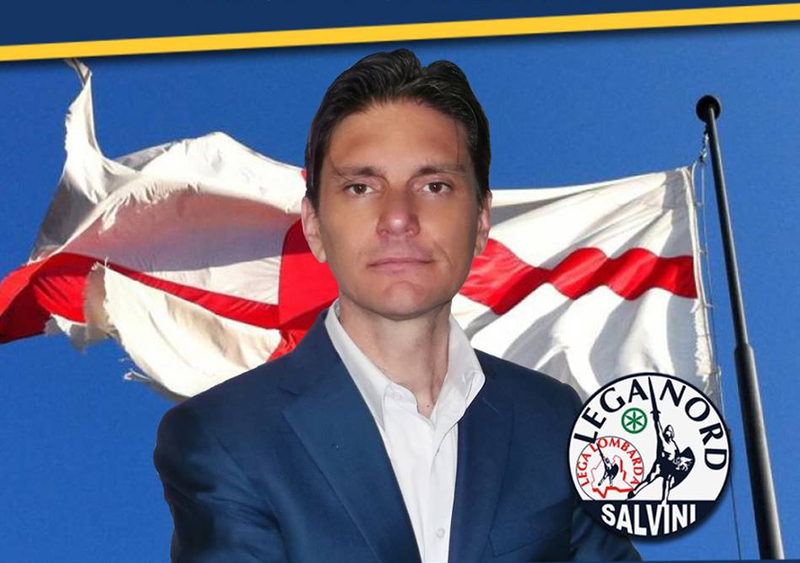 Max Ferrari, a member of the Italian far-right Northern League and contributor to the Italian edition of the Voice of Russia, initiated the creation of the openly pro-Kremlin Lombardy-Russia Cultural Association dominated by the Northern League. Russia’s then Ambassador to Slovakia Pavel Kuznetsov (left) meeting co-editors of the Slovak far-right conspiratorial magazine Zem & Vek Tibor Eliot Rostás (centre) and Dušan Budzák (right) in May 2014. 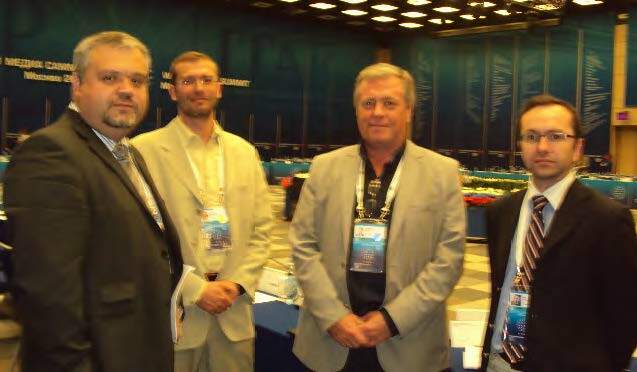 (left to right) Vasiliy Likhachev, an MP of the Communist Party of the Russian Federation; Armen Oganesyan, the editor of the journal International Affairs; and co-editors of Zem & Vek Tibor Eliot Rostás and Dušan Budzák. Moscow, June 2015. The Austrian far-right Freies Österreich blog launched in 2014 was hosted by a Russian Internet company and had subtitles written in Russian language. This entry was posted in Uncategorised and tagged Chapter5, pictures. Bookmark the permalink.